Imagine having a life-threatening illness only for doctors to think you’re faking it. had a guaranteed Fed Ex delivery date of four days from Europe. But hers took fifteen years, three months, and twenty-two days. Sue was admitted to hospital, in agony, hundreds of times, but when her disease was assessed as not serious enough to be causing that level of pain, she was labelled as mentally ill and manipulative, a drug addict shopping for painkillers. 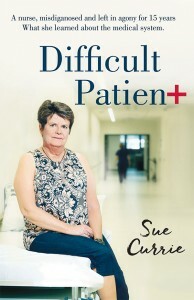 Though Sue, herself a nurse, knew her pain was real and how it could be treated, the ‘experts’ refused to believe her. She became a difficult patient, forced to stand alone against the entire state medical system. Eventually, after years of fighting and irreversible damage to her body and mind, she found the medical maverick who would save her life. Difficult Patient is a powerful and timely account of falling through the cracks in the medical system, a compelling story of cover-ups, power plays and, ultimately, redemption.